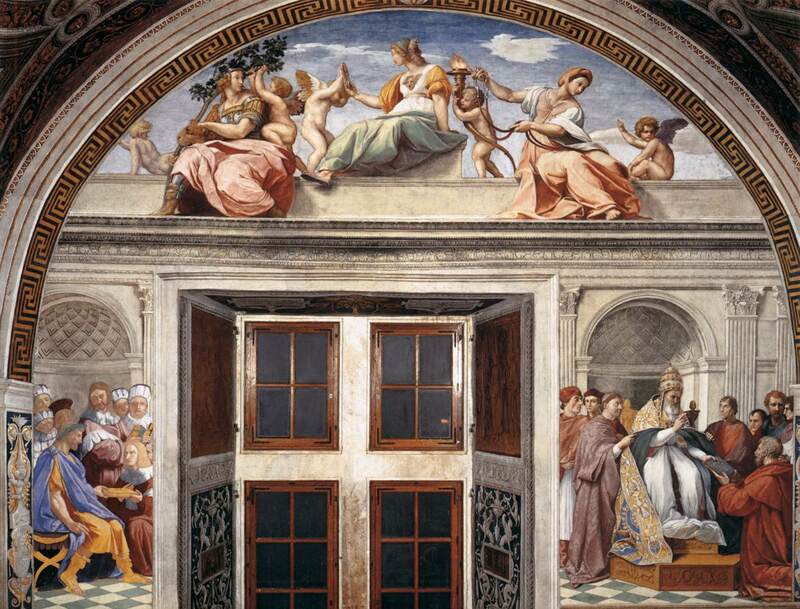 In the previous post we have seen that Lorenzo Lotto (c. 1480-1556/7) worked with Raphael Santi on the papal apartments in the Vatican some time after 1509 when he received advance payments for work still to be carried out. But how long did he stay in Rome? 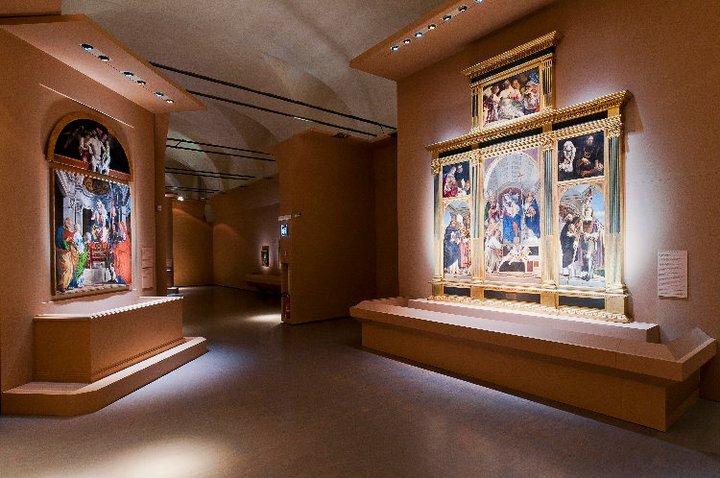 So far it has been assumed that the commission for the Colleoni Martinengo altarpiece in Bergamo for which he signed the contract in 1513 meant that he had left Rome forgood. But what if he had not? Are there more frescos in the Vatican Stanze that could possibly be identified as his? It has recently been suggested that, apart from the Pandects fresco in the Stanza della Segnatura, Lotto’s hand can also be detected in the central vault of the Stanza di Eliodoro (Figs. 1 and 2). Raphael Santi started work here after the room had already undergone significant changes. A chronology of the decorations of this room too complicated to outline here, but in 1511 no one could have foreseen that the patron of the project, Julius II, would die two years later and that his successor, the Medici pope Leo X, would order various alterations. For instance, while Julius’ coat of arms and inscriptions with his name remained above the spandrels, the central part of the vault was modified from eight sectors to four, each twice the size of the original eight sectors. It is that new vault that concerns us here. The general theme of the room, specifically developed for Pope Julius, is that of God’s intervention in human destiny. The central vault presents episodes of divine intervention in the history of Israel (the Moses and the Burning Bush, the Announcement of the Flood to Noah, Jacob’s Dream and the Sacrifice of Isaac) for which, as in the case of the Pandects, Raphael made the designs. Stylistically the vault has puzzled people ever since the 17th century when the attribution to Raphael was already questioned. Since the discovery of Raphael’s preparatory drawings (Fig. 4) and taking into account the rare cartoon fragment for the figure of Moses in Moses and the Burning Bush (Fig. 3), Raphael’s authorship was generally accepted half a century ago. The difference in appearance between the vault and the other frescos in the room was ingeniously explained by assuming that they are “fictive tapestries”. It is certainly peculiar that the scenes seem to be bordered by painted ropes, as if they are textiles attached to the ceiling by means of a noose. See, for instance, a detail from the Noah fresco (Fig. 5). But that still does not mean that Raphael painted them. The colossal figures and the colour scheme of the vault frescos are based on Michelangelo’s Sistine ceiling. In particular the colori cangianti of Noah’s wife (Fig. 6) recall figures such as the seated woman in the lunette of Michelangelo’s Achim and Eliud and her cap resembles that of the Cumaean Sibyl (Fig. 7) while God the Father, with his fluttering green drapery and large attendant putti is adapted from Michelangelo’s vision of God in the Creation of Adam (Fig. 8), suggesting that the planning and execution of the Eliodoro vault postdated October 1512 when the ceiling of the Sistine Chapel was unveiled. A preparatory drawing for the vault scene of Moses and the Burning Bush (Fig. 9) provides a clue for another date: on the same sheet are several architectural sketches. When Bramante died in 1514 it was Raphael who succeeded him as the new architect of St Peter’s and the architectural drawings may relate to his new task. They are dated by Oberhuber between 1 April and 1 August 1514. Since Raphael seems to have finished work in the Stanza di Eliodoro and had started work on the Stanza dell’Incendio by 1 July 1514, it seems that the “fictive tapestries” date from this period. Already in 1926 and 1931 it was suggested by scholars that the Eliodoro vault was painted by the same hand as Tribonian presenting the Pandects to the Emperor Justinian in the Stanza della Segnatura (see previous post) and following the recent restoration, which allowed for a more thorough analysis, there appears to be more evidence to support this theory. 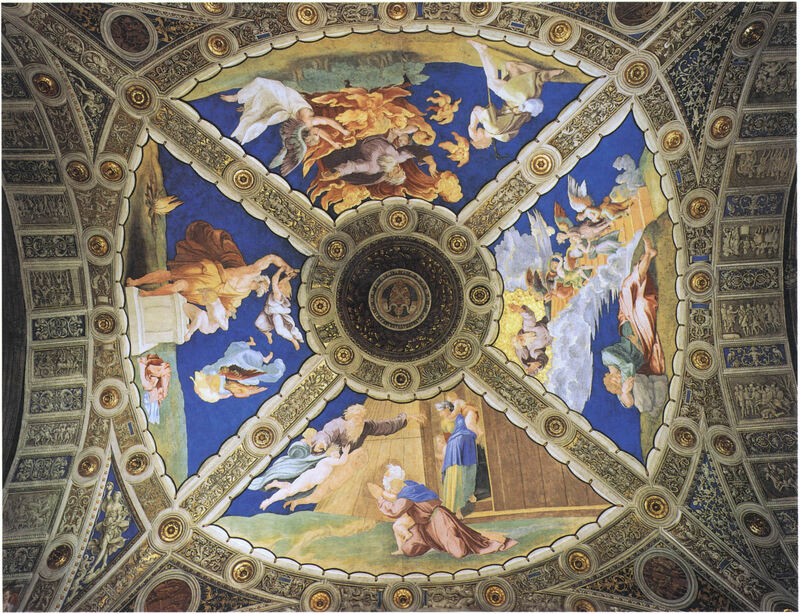 The vault’s extensive areas of a single colour seem to reduce the volume usual in Raphael’s figures and although the monumentality of the figures and details such as the heads of the putti and that of God the Father conform with Raphael’s style, the colour scheme and the application of the colours does not. For instance, the well-preserved blue backgrounds are reminiscent of Lotto’s later fresco of Christ the Vine in Trescore’s Oratorio Suardi (Fig. 10). In addition, the present condition of the Eliodoro vault corresponds with what we have seen in the Pandects: the colours are applied in layers rather than being modelled tonally and the pigments have carbonised less in the upper layers resulting in paint losses. The upper layers have become so brittle that mere rubbing of the surface has a considerable influence on their appearance. 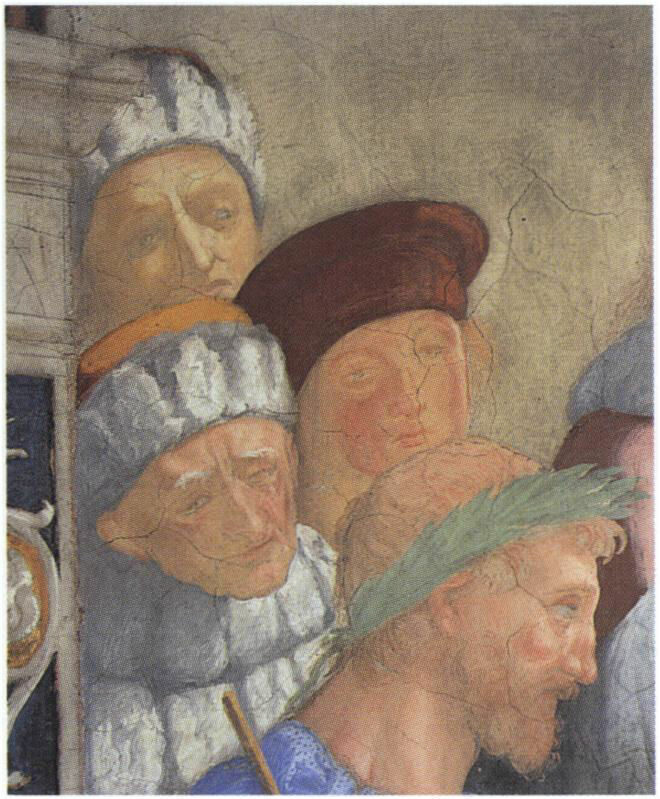 Heads such as that of Jacob in Jacob’s Dream (Fig. 12) and those of the judges in the Pandects (Fig. 11) resemble each other in the way the faces are modelled by a kind of rouge applied to their cheeks on top of the base fleshtones. The painter created contours in a very personal and distinctive manner by leaving a fine, thin line of the grey plaster to appear between two areas of colour. This is also evident when one compares facial tonalities and painterly treatment of, for instance, Lotto’s head of a putto from Moses and the Burning Bush and a Raphael putto from the Stanza della Segnatura (Figs. 13 and 14). Glaring eyes underlined with red brushstrokes, such as those of the son embraced by Noah (Fig. 16) in the vault, also occur in the figure of Lotto’s Cimmerian Sibyl (Fig. 15) at Trescore. It is characteristic of Lotto that all his children and angels are blond. This applies even to God the Father in the Noah scene, who is depicted with fair hair (see Fig. 2). When did Lotto leave Rome? If we accept that Lorenzo Lotto painted the vault of the Stanza di Eliodoro, that brings us the problem of the painter’s itinerary. From his early works which can be dated with certainty, either because he signed and dated them himself or because the contracts for them have survived, we know, for instance, that he started painting the Entombment of Christ for San Floriano in Jesi on 27 October 1511 and started work on the Colleoni Martinengo altarpiece (Fig. 17) for the church of Santo Stefano in Bergamo on 15 May 1513. 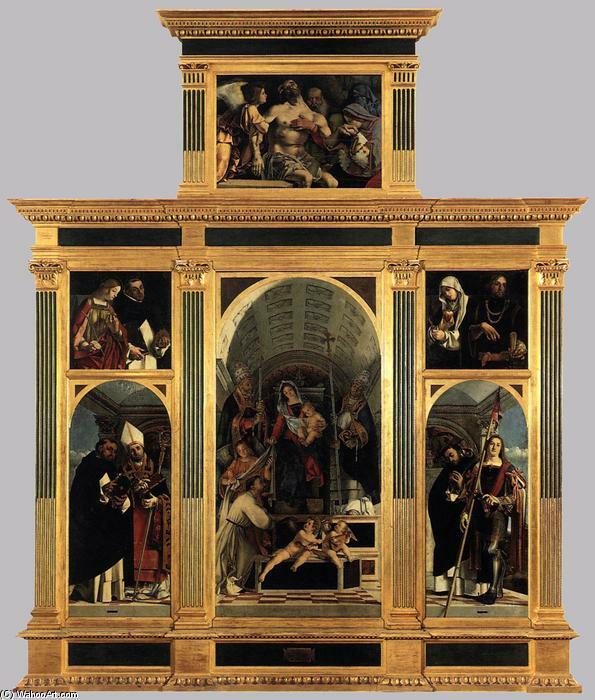 This magnificent and monumental altarpiece took three years to finish: it is signed 1516. In fact, it was the largest altarpiece Lotto ever painted: its central panel, a Sacra Conversazione, measuring 520 x 250 cm. Even at this size, three years seems rather long to complete an altarpiece. Was Lotto, having moved to Bergamo, summoned to Rome again in 1514 to assist Raphael on the Stanza di Eliodoro? Had he heard of Bramante’s death that year and had travelled to Rome on his own initiative in the hope of taking over direction from Raphael in the papal rooms? Or did he not leave Rome at all? Lotto’s signature on his dated pictures in Jesi and Recanati does not prove where they were painted, whether on site or in a Roman studio from where they were sent to their final destination as was done during the years when Lotto lived in Venice. Until now, Lorenzo Lotto’s activity in Rome could be reconstructed only from the two payments for his work in the Stanze in 1509 and from a drawing attributed to him of the ancient sculptural group of Hercules and Antaeus in the Belvedere statue court. 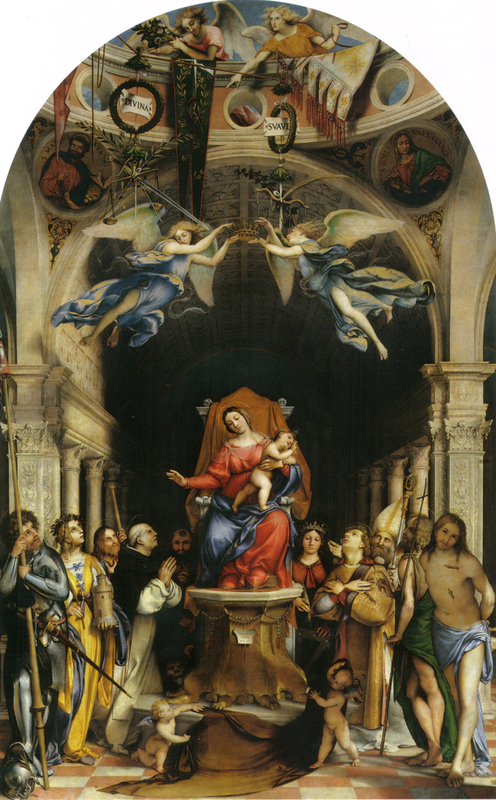 If Lotto intended from the start to paint the Colleoni Martinengo altarpiece in Bergamo, it meant that he must have returned to Rome in 1514, perhaps to collect his belongings and pack up his studio, and was engaged there briefly by Raphael to paint the Eliodoro vault, something that could be done in a relatively short time. 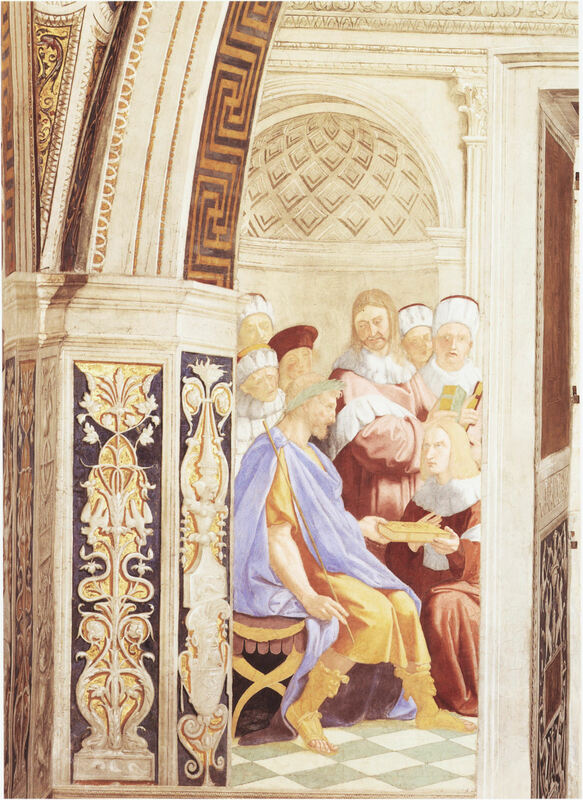 For some of the figures in the Colleoni Martinengo altarpiece Lotto seems to have drawn inspiration from Raphael’s design for the Eliodoro vault, but rather than relying on the finished mural, he may have used Raphael’s autograph preparatory sketches, especially that for Moses and the Burning Bush. If Lotto stayed in Rome, he presumably got to know the Stanze intimately between 1513 and 1516. He may even have used two drawings by Raphael of Victories from the Arch of Titus in the Roman Forum (Fig. 18) for his pair of angels in the altarpiece, particularly their draperies and their bare legs (Fig. 19). It is tempting to think that Lotto must have returned to Rome after he signed the contract in Bergamo, at least for a short period. If in fact it was he who executed the fictive tapestries on the vault and was therefore became, at least temporarily, a member of Raphael’s workshop, his deep knowledge of Raphael’s frescos for the Stanze is not surprising. Of course this is conjecture at this point. Further dedicate research in Rome’s archives or a chance archival find there might one day provide further answers. One thing is clear: the collaboration with Raphael Santi left a lasting impression on Lorenzo Lotto. In the rivalry that existed between Michelangelo and Raphael, Lotto belonged firmly in the latter’s camp. Michelangelo’s frescos seem to have made little impression on him, nor, for that matter, did the antiquities and architecture of Rome, none of which appear in his post-Rome paintings and antiquities only as props in the portrait of the collector Andrea Odoni, no doubt at Odoni’s request. 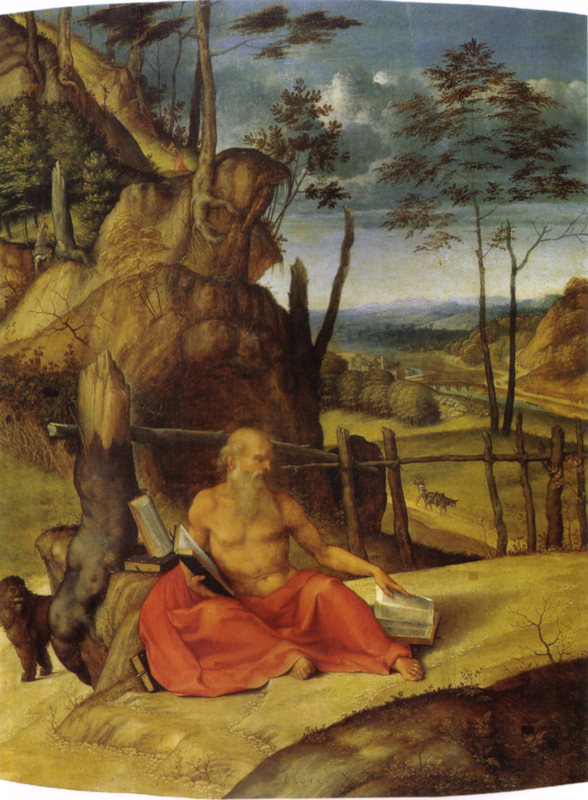 The only reference to Rome’s architecture in Lotto’s paintings is in a small panel depicting Saint Jerome (Fig. 22), which Lotto painted in Rome, probably in 1509 judging from its partially legible date. The large circular building in it has been identified as Castel Sant’ Angelo where the panel is still kept today. But the figure of the Saint is derived from Raphael’s reclining figure of Diogenes in the School of Athens fresco in the Vatican palace (Fig. 20) while the head appears based on Raphael’s Saint Jerome in the Disputation of the Holy Sacrament fresco (Fig. 21). Because of these rather self-conscious borrowings, I think Lotto intended the panel as a homage to Raphael. For selected literature I refer to the previous post. 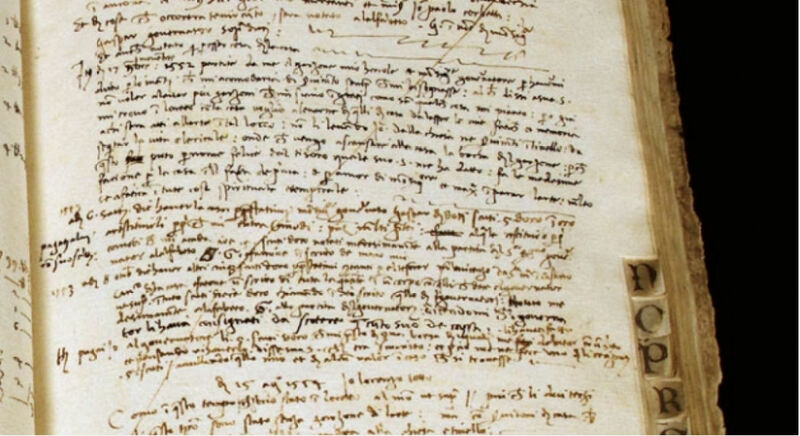 While Lorenzo Lotto’s life is extremely well documented with such unique personal documents as the thirty-nine letters he wrote in connection with the designs for intarsia for the church of Santa Maria Maggiore in Bergamo, his will, and the spese diverse (the account books he kept meticulously during the last twenty years of his life and which also contain many details about his personal life and character), it was not until around the publication of Berenson’s second monograph that documents were discovered in the Vatican Corsini Library pertaining to advance payments to the artist concerning his work on the frescos in the papal rooms, the Stanze. Berenson’s mystery was solved: the artist had been called to Rome. It has always been assumed that Lotto’s frescos in the Stanze were completely destroyed soon after they were painted because they were deemed inferior to Raphael’s. 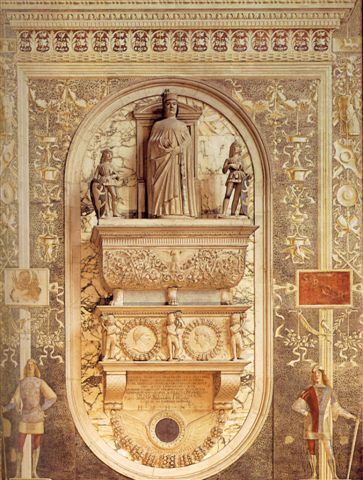 Nevertheless, there have been numerous attempts to identify Lotto’s hand in the Vatican or in other Roman decorations but his contribution has never been established convincingly. To these theories, the recent restoration of the Stanze added another although the catalogue of the last great exhibition at the Scuderie del Quirinale in Rome seems to ignore it. But for that exhibition every conceivable painting or altarpiece that could be removed safely or even unsafely was transported to Rome and since that would have been impossible with frescos it explains the lack of interest in Lotto’s murals, a fate they have suffered in most recent publications following exhibitions of the paintings. Lorenzo Lotto is not first and foremost remembered as a fresco painter but more for his highly individual religious paintings and his humane and empathic portraits. A native of Venice, something he stressed proudly all his life, he left the city for long periods to work elsewhere, mostly in the Marshes. The reason for this was presumably practical: once he had established his reputation there his popularity among the local nobility and clergy kept him busy throughout his life and even when he returned home for certain periods he shipped new altarpieces to these distant places from Venice. Yet to be commissioned for such a prestigious commission as the Stanze in the Vatican, even if he was to be part of a group of pan-Italian artists working under Raphael Santi, must also have been based on his work as a fresco painter. Unfortunately, no pre-Rome frescos by Lotto have survived. The papal architect Bramante, who had been engaged in a project in the holy city of Loreto, a place of pilgrimage much favoured by Pope Julius II, and who may have seen Lotto’s altarpiece for the church of San Domenico in nearby Recanati is credited for having secured the painter’s commission at the Vatican. Bramante probably also saw frescos by Lotto in Treviso but these seem not to have survived. It has long been assumed that Lotto painted a pair of pages beside the tomb of Agostino Onigo in the church of San Nicolò, Treviso, but the majority of scholars have now rejected the attribution. Clearly Bramante was impressed with Lotto’s work, enough to recommend the painter to the Pope. Lotto’s altarpiece for the church of San Domenico in Recanati (1506-1508) displays the compositional influence of Venetian painters of that time, for instance Bellini’s Sacra Conversazione for San Zaccaria in Venice, completed in 1505. The Pietà in the upper lunette recalls Carlo Crivelli’s renditions of the subject in its intimate pathos while the dark background of the Pietà and some of the figures such as Nicodemus recall the influence of Dürer whose art had a lasting influence on Lotto. Yet there is a determined individuality here, for instance in the contrast between the pervasive melancholy and the amusing detail of the child angels in the lower foreground, who seem startled by the entrance of St. Dominic. In May of 1508 Michelangelo had started planning the frescos for the ceiling of the Sistine chapel and in the autumn of that year Perugino, Sodoma and Bramantino were engaged in Pope Julius II’s suite of private apartments. Probably shortly before, during the summer, Raphael, then a talented young artist, had arrived to paint the room that became known as the Stanza della Segnatura, at first largely with his own resources. He did not only establish himself at the highest artistic level in these frescos but also revealed his abilities for dealing with other artists and a demanding Pope while maintaining full control of the project. 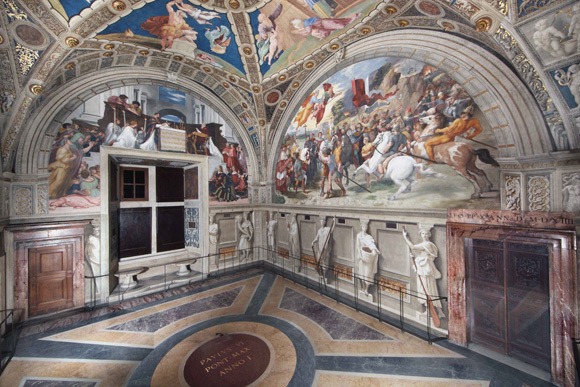 Much of Lotto’s work in the Stanze della Segnatura has not survived, but it is certainly apparent that the left scene on the fourth or Jurisprudence wall is stylistically and technically different from Raphael’s fresco on the right side of the window. Consider, for instance, the lunette above the window where three of the Cardinal Virtues, Fortitude, Prudence and Temperantia, are evidence of Raphael’s accomplished and confident handling, a refined modelling of light and subtle shading of the idealised female figures. 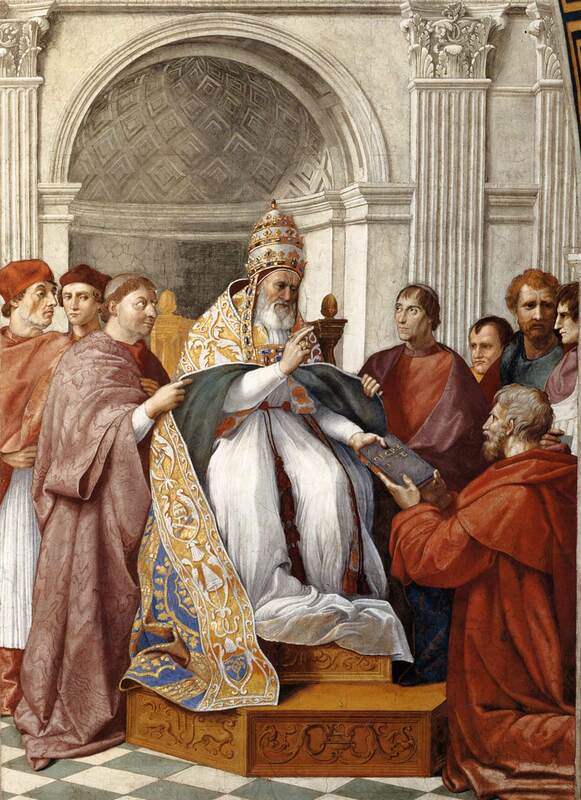 The scene of Gregory IX approving the Decretals to the right of the window shows Raphael’s brilliance at portraiture: none other than Pope Julius II, wearing his famous beard that he had started growing after his defeat at Bologna, modeled for Gregory IX. In contrast with these scenes, the scene on the left side of the window, Tribonian presenting the Pandects to the Emperor Justinian, makes an altogether different impression. Clearly another artist than Raphael or his close collaborators was at work here. Some suggestions that have been put forward, however, have been discarded. For instance, since the Pandects seemed to have reminiscenses of the “Venetian manner”, Sebastiano del Piombo has been put forward as a candidate. But del Piombo came to Rome only when the Stanza della Segnatura was finished and his involvement would only be tenable if the fresco had been repainted by him at a later date. Although del Piombo is known to have carried out restoration work on the frescos after the Sack of Rome in 1527 there appears to be no technical evidence that the mural is a different one than the original fresco of 1511. Another candidate that was put forward is the French glass-painter Guillaume de Marcillat who is documented as working in the Vatican in 1510. 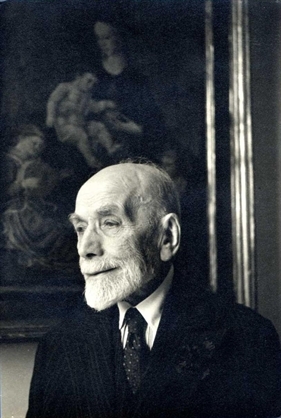 The argument against de Marcillat is that he only started to work in fresco some years later in Arezzo and at any rate recent studies of his style exclude him as a candidate. Raphael chose an unusual but symbolic event for the scene which shows the Emperor Justinian receiving the Corpus Juris Civilis (which included a digest component, called “pandects”) from his trusted jurist Tribonian. This was an essential part of Justinian’s Roman law consolidation effort of 533 AD which was seen as a monumental contribution to law and order throughout Europe in the 16th century. Lorenzo Lotto’s involvement in painting the Pandects seems to fit more convincingly than that of other candidates put forward. Lotto was paid 100 ducats on 9 March 1509 for unspecified work in the “upper rooms of he pope next to the upper library” and received another 50 ducats on 18 September 1509. Both payments indicate that he had been working in the Vatican for some time as part of the team of artists including Perugino, Sodoma, Bramantino, Johann Ruysch and, of course, Raphael, brought together to decorate the new suite of papal apartments, the Stanze. Lotto’s fresco technique changed very little over time which makes comparisons between the Pandects and his later frescos possible, such as those in the Capella Suardi in Trescore, the Marian Cycle in the church of San Michele al Pozzo Bianco in Bergamo and even the now much damaged frescos in Credaro. The stylistic differences between the Pandects and the scene with Gregory IX on the other side of the window became more apparent during the most recent restoration. The Pandects appeared more damaged than the other frescos in the room, in part due to treatment with aggressive solvents in earlier restorations, but also because the volumes in this fresco seemed not to have been achieved through the modelling of different colours or tones of a colour (cangiante) as in the Virtues or the Approval of the Credentials but rather by the application of successive, fairly even layers of different tones one on top of another as becomes most evident in the faces. 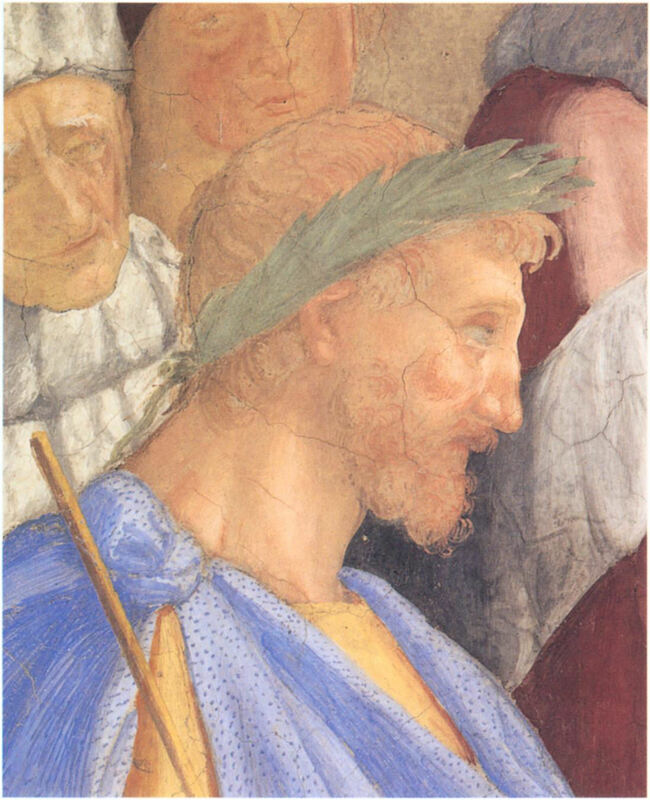 Due to this technique the upper layers of colour have fallen off in the course of time which resulted in losses that are more severe than in the other frescos which are less dependent on layering and therefore change less in depth. 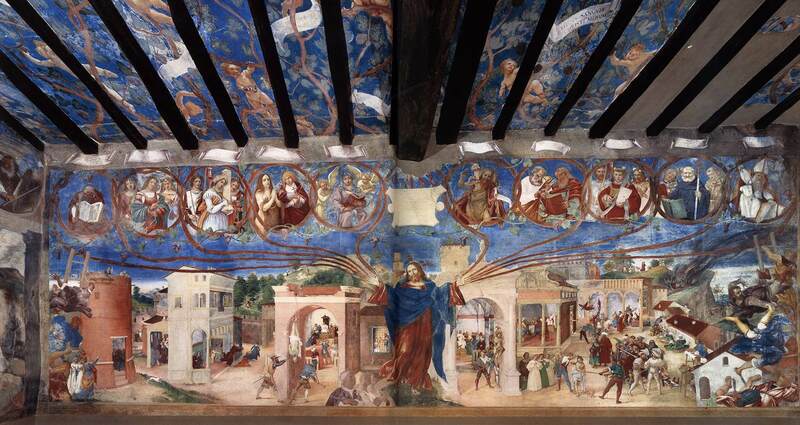 It is telling that the same losses occur in Lotto’s other surviving frescos executed in Trescore, Bergamo and Credaro. The head of the Emperor Justinian in the Pandects, for instance, has been executed in thin, plain layers of colours finished with a few strokes of hatching added with the point of the brush – a technique that bears similarities to Lotto’s Suardi fresco cycle in Trescore or the badly preserved St Lawrence in Credaro where the flesh tones are built up with several layers of colour, one on top of another, with the contours giving the final definition. Lotto employed broad areas of local colour in the figures in the murals at San Michele al Pozzo Bianco. 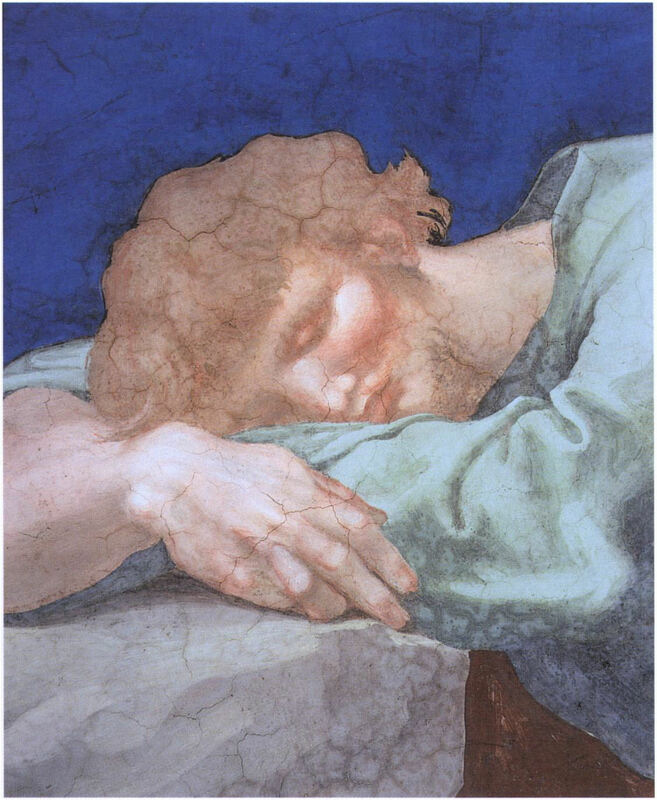 Equally, in the Pandects, we see large panes of yellow, blue and dark red, contrasting with the far subtler colori cangianti (changing to a different, lighter, hue when the original hue cannot be made light enough or changing to a darker hue when the original hue cannot be made dark enough) employed by Raphael on the same wall. Lotto seems to have treated frescos much the same as he would have a painting in oils, applying one layer over another so that, due to the chalky nature of the plaster, there is more wear than had he employed the medium to its full advantage. It was previously thought that the discrepancies in style between the Pandects and Gregory IV approving the Decretals was solely due to the first fresco’s poor state of preservation, and indeed some scholars have merely ignored this discrepancy, but given the techniques used it may point to Lorenzo Lotto as the author in which case we would have tactile proof of his involvement in the creation of the Stanze. By any means that involvement would have been limited and Lotto cannot be credited as the inventor of the scene. Even though Raphael did not assume full command of the Stanze around 1513, his capacity to delegate was already apparent at the time when the Jurisdiction wall was painted. 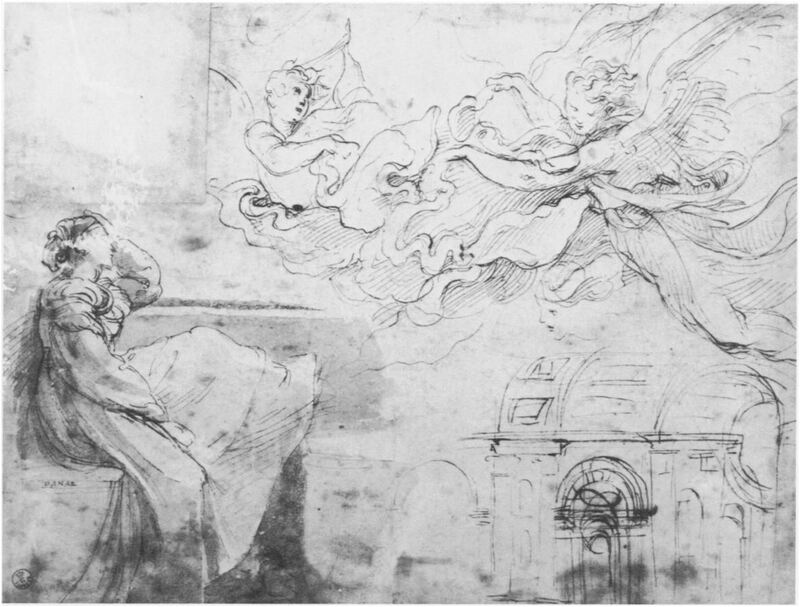 There is a compositional drawing in Frankfurt, largely executed in brush and wash and partially gone over in pen and ink, which relates to the figure group and which is thought to be a preparatory study by Raphael for the Pandects since there are significant differences between the drawing and the fresco such as the number of figures which was reduced in the latter, and changes to their hair and hats. At a later stage, with the composition fully worked out, Lotto would have been provided with a life-size cartoon for transferring the composition to the wall. Coming back to Berenson and his wonder at the apparently overnight change in Lotto’s style after the years that could not be accounted for, the answer seems to be Raphael. 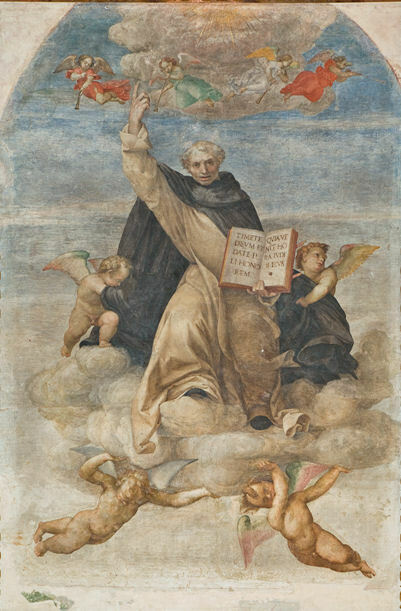 Apart from the colour scheme of Lotto’s painting of the Transfiguration where, compared to his earlier work, the colours and overall tone are astonishingly bright, Lotto executed his Saint Vincent Ferrer in Recanati, of which only a damaged fragment survives, still deeply under Raphael’s spell. The Saint’s vigorous contrapposto and the unprecedented classical character of the flying angels seem a direct response to Raphael, while the ascetic appearance of the Saint is entirely in keeping with Lotto’s own artistic temperament. 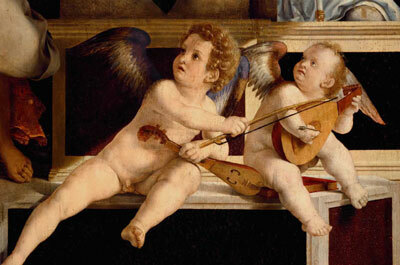 Even here he adds a quirky individualistic element: the putto on the left has his arms under the ascetic Saint’s robe. 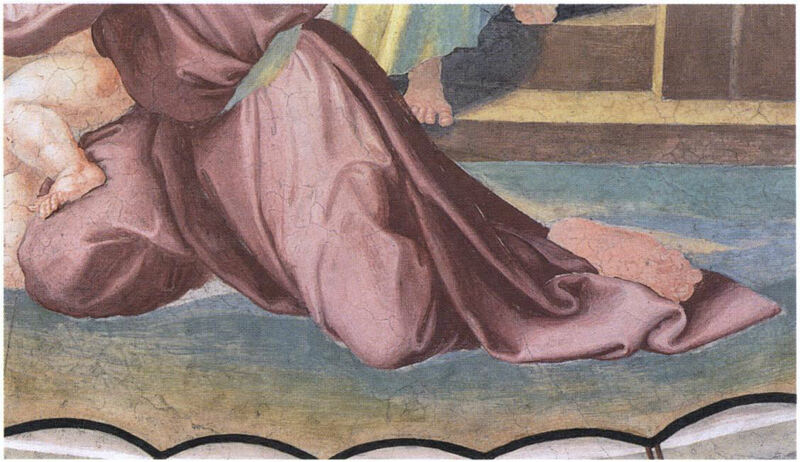 In the next article we will move from the Stanza della Segnatura to the Stanza die Eliodoro to see whether it is tenable that some of Lorenzo Lotto’s frescos there survived, notably – for an artist who has been considered the painter par exellence when it comes to painting carpets – a carpet in fresco.